You never know what you might find in a book, besides the printed contents and illustrations. Bookmarks, of course, some for long gone bookstores and libraries. Marginalia in pencil or ink or crayon, lovely. Signatures, cryptic notes, dates. Holy cards, baseball cards, coupons. Money, printed bills of different denominations. But most precious, letters, notes, and envelopes. Such sweet mysteries, understanding those written messages hidden away for years and years. Why were they tucked away in the gatherings of a book? Were they secret? Were they forgotten? 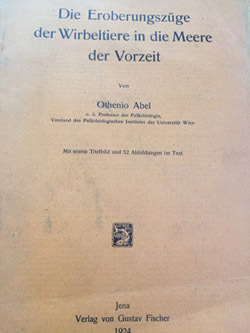 A few years ago, at an auction, I acquired, as part of a lot, Othenio Abel’s (1875–1946) Die eroberungszüge der wirbeltiere in die meere der vorzeit (Jena: Verlag von G. Fischer, 1924). It was once in a collection of books and pamphlets by Abel forming part of the library of a Dutch paleontologist. Othenio Abel has always fascinated me as one of the founders of modern paleozoology and paleobiology, trying to understand extinct creatures, like dinosaurs, as living organisms. We might consider some of Abel’s reconstructions silly today, but they inspired many a future paleontologist with their creativity. When the package arrived with Abel’s printed works, I set aside Die eroberungszüge der wirbeltiere in die meere der vorzeit because it was in sad shape, needing some help to make it functional. Months passed before I returned to Abel, to assess my options for binding and repair. I decided to collate the book to make sure it was complete. I delicately started to count pages and illustrations, when I saw three fragile letters tucked into the middle of book. 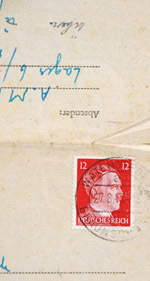 I literally dropped Abel and the letters because of the stamps on the covers — Third Reich issues all postmarked between August and November 1943, Braunschweig, Germany. I overcame my shock and picked up the letters and Die eroberungszüge der wirbeltiere. The messages all were written in a very small script in order to efficiently use the aerogram formatted sheets, but alas were written in Dutch, not my most proficient language. Fortunately, that particular April Sunday, friends were visiting, including one who could read these letters from a faraway time and place. A quick survey of the contents indicated that these notes described conditions in what seemed to be a political prison camp near Braunschweig. 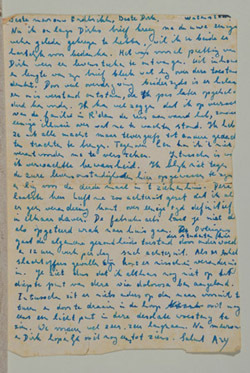 The author of the letters described some of his privileges in receiving packages of clothing and food from friends and relatives in the Netherlands, without too many details on the kind of work in a factory. There were observations about bombers flying overhead and preparations made in case of a raid. The camp included Dutch and French prisoners. I needed a more detailed translation and more context for the letters. But what should I do with them in first place? There was no indication in the original description of the lot by the auction house that the letters were ever noticed in the first place in Othenio Abel’s book. I could keep the letters, but why? Ethically, the right decision seemed to be to return these notes back to the family of the original recipient. I turned to my Dutch colleagues for help. Eventually, the auction house in Leiden provided me with the name of the individual who had placed the items on auction in the first place. The letters were gladly returned, in the hopes that they are never lost in a book again.